I'm just hearing terribly sad news that Eugene Burger has passed away. Another legend moved on. I was lucky enough to have met him and what a wonderful person he was. This is extremely sad news. Eugene was one of the living greats. "It is with heavy hearts that we, friends of Eugene Burger, inform you that Eugene has passed away in Chicago at the age of 78. We know that in the days, weeks, and months ahead, countless things will be written and said about Eugene, and we will share more information, too. But for now we want to tell you that Eugene embraced his situation with great clarity, humor, and peace of mind. As he said one day, "Now I am on the way to the ultimate capital M Mystery of life." I'm devastated. Eugene was such a fountain of knowledge and inspiration. I feel lucky to have shared many good times with him at Mystery School and the ICBM's Gathering of the Magi. He was always there to help you become a better magician. I remember the first lecture I attended of his. He only performed a handful of tricks. The old timers walked out grumbling because he didn't do enough tricks. Meanwhile I was soaking in the knowledge of how to make my magic better. It was a major turning point in magic for me. My sons and I went to the Winter Carnival of Magic in Pigeon Forge a couple of years ago when he was there. At the final night pizza party in the hotel lobby, we were just sitting quietly when suddenly Eugene just sat down with us and said, "Can I show you some magic?". He didn't know us from Adam, but he proceeded to completely floor all three of us for the next ten minutes, all the while making us feel like he was having just as much fun as we were. It was the first time I had actually felt like a spectator again since I had begun learning magic. I literally had no idea how he was accomplishing his miracles, and when we asked if they were from his books he told us they were tricks he was saving for a book that would be published after his death called "Eugene Burger Speaks From the Grave". I have no idea if he was joking or not, but it really does sound like something he would do. I had the privilege of sitting across the table from him two other times in other conventions since then, and I can honestly say he fooled me every time. I was really looking forward to seeing him at Magic Live next week. He didn't always teach a thousand tricks in his books or in his lectures, but if you paid attention to what he was telling you, you were learning how to take stuff you already did and make it magical. He was a true magic teacher. Very saddened to hear this. A one of a kind thinker with profound insight, who helped me understand that magic was about so much more than just the tricks. I feel this planet is diminished by his final vanish. Although I have read Eugene's truly inspirational writings and watched him numerous times on video, I never had the pleasure of meeting him. And yet, I always felt like I knew him. I too am very saddened to hear of Mr. Burger, RIP. I met him once at Magic, Inc. It was during a Max Maven lecture intermission. He was friendly, talkative, knowledgeable, and so wise. His wisdom lives on in the media he created and in those whose lives he touched. I wish his family the very best and my thoughts and prayers are with them. Meanwhile - a Eugene story: My wife Maria and I both knew Eugene fairly well. He'd see us at a convention and say, "You need to come up to Chicago. We'll play." We'd rent the extra room in the apartment complex he lived in. It was a few doors down from his room. Then we'd go do dinner and wander around Chicago going to bookstores and other shops. We'd walk and talk about magic, life, politics, religion etc. Then up for a breakfast meeting with some of Eugene's many friends. Wonderful people. I gave him a copy of my book inscribed "To my friend Eugene who inspires me both in magic and in life." Those were very heartfelt words. "But for now we want to tell you that Eugene embraced his situation with great clarity, humor, and peace of mind. As he said one day, "Now I am on the way to the ultimate capital M Mystery of life." I was fortunate to meet him in the UK, last year, and spent a few minutes chatting to him. I have truly never met anyone else like him. Some people have a certain energy about them that radiates and touches all those around them. Mr Burger was one of those people, and although I was only with him for a little while, he left me in awe. I think the greatest thing we can accomplish in life is to either inspire others to learn or teach others and pass on our wisdom, whatever form that takes. Mr Burger, from what I saw, achieved this many times over. It is sad that so few people outside the magic community knew of him. Quite simply, he was a true gentleman. Very sad news. What a loss. I grew up watching his magic & mentalism. Enjoyed his work (and voice) very much. A 1st generation connection to classic bar magic. I was lucky to be working with Kozmo when he was taping an interview with Eugene for Reel Magic Magazine. During breaks and down time Eugene was quite candid and talked a lot about his life and magic. The interview became a 2 part piece as Eugene had so much to say. He had a unique ability to ask you a question that would make you step back and do some thinking. I can't think of any other writer whose written word evokes his spoken word so much, his intonation, his pauses, his inflections, like Eugene Burger. As you read his work he is in your head, it is his unmistakable voice. It feels like he's there with you. I never met him or saw him in person, but it feels as though I do when I read his work. Harry has this talent. Few do. I think Kozmo is making Eugene's 2 part interview available to non-subscribers of Reel Magic. I'm glad to hear that Kozmo is going to make the Burger interviews public. It will be very worthwhile to listen to them. On the recordings I made of Eugene, there's a moment when he says, "Mike, magicians sometimes forget that this stuff (magic) is important...." He goes on to elaborate. I promised Eugene that I would keep the recordings to myself and I always have. But now that he's gone, it might be good to find some moments in the recordings that are worth sharing. I'm sure he would approve. I agree with Gareth regarding Eugene's writing style. When you read his work, you can almost hear him talking. Eugene is very inspirational. He gets me thinking about my magic. Why am I performing the tricks that I do? What do I want the spectator to get out of my magic? He is also a master of opening his magic with a sentence that garners attention. A tale of medieval torture with playing cards. We have "The Vernon Touch." There should be "The Burger Influence." As magicians everywhere grieve Eugene Burger’s passing, I have been asked many times if there will be another book coming from him. The answer is YES. 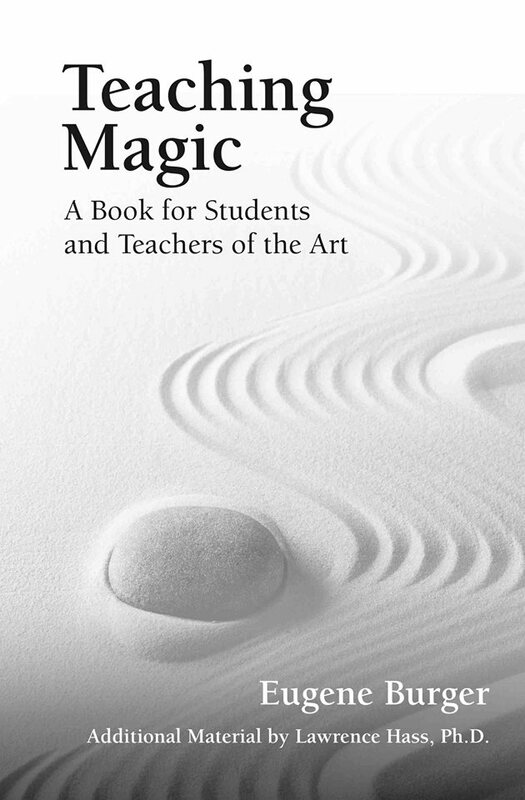 Over the past several months, Eugene and I had been working intensely on a book titled, TEACHING MAGIC: A BOOK FOR STUDENTS AND TEACHERS OF THE ART. I sent the book to the printer just before Eugene’s diagnosis, and so it is untouched by awareness of his loss. The book will be released this fall. One last note: Eugene absolutely loved the cover and was so excited about this book. Hold on, friends, Eugene has one more gift to give. That's great news about the book. Thanks for sharing that for those of us not on FB. This will most definitely be added to my library upon release. Eugene was a master. His writings literally changed everything about the way I look at our art. I have learned so much about performing, scripting and technique from reading his publications. This man was definitely one of my heroes. I was fortunate enough to meet Eugene a couple of times in the past and was always in awe of his wisdom and style. He had a style that will never be duplicated. A couple of years ago I sent Eugene an email letting him know how much he had influenced and inspired me in my magic career. After that we shared a few email conversations back and forth, conversations that I am proud to say that I had with one of the greatest. When I create or script an effect, I always think of two people. Derren Brown and Eugene Burger. I have two things I always think to myself...WWDD and WWBD...What Would Derren Do and What Would Burger Do. This thinking without a doubt helps to make my performances better. RIP Mr. Burger, you are a true legend and will be missed by many. "My teacher for over 30 years and my best friend taught me how to live, grow old gracefully, and how to die with dignity. I have shared more time with this great man that any other man in my life. Every moment was a blessing and his spirit lives on in his students and his works. Eugene's life was brighter than 10,000 suns." The death of Eugene Burger, a legend of modern magic, has just been announced. Much will be said in the magic community about Eugene’s passing. I cannot think of another figure in our strange and wonderful world who was (and is) as loved, who loved as much back, or who truly gave himself up to the stuff of mystery. He inspired a generation of close-up magicians – including me, very directly – and will continue to do so. When I first met him as a novice, he taught me a great lesson in how to make magic feel special. We later became friends, and though I lived too far away to count myself amongst his close companions, we would see each other when we could and had a lot of love for each other. Yet there is something else surrounding his death that has struck me, which may be passed over amidst the eulogies, and may even sound a little strange to say now. And that is, that his death was somehow suitable. As a magician, Eugene was a master storyteller. His magic hooks you in because it weaves a narrative around the possibility of deep mystery. In life we weave stories continuously: in order to navigate the infinite data source of our environment we must edit and delete and reduce an active, messy world to a neat story that makes sense of what’s going on. We tell ourselves stories of who we are, how we got to where we are, what we want, what other people want, what they think of us. If we are mindful, we might try to see our story-telling capacity at work, and remind ourselves that we are continuously twisting the facts to fit whatever story has gripped us. We should of course own our narratives, but we might also choose to be aware that they remain just that, otherwise they have a tendency to own us. Eugene seemed to be a man in charge of his own story, yet mindful of its contingency within a world of deep mystery. When we are not, we are usually beset by needs and forever chase external approval and goals that continually elude us. By comparison, Eugene lived with a minimum of possessions (he knew little of the collecting mania which drives many of us in our field) and seemed to have no particular ambitions beyond the grateful enjoyment of the here and now. If you know his work but never met him, he was exactly as you’d want him to be, and then some. I found this almost too good to be true: I wanted to understand how the love for magic could continue to run so deep in this brilliant, philosophical man, without a hint of the weary cynicism of which we are all guilty. How it was to find his only family in the magic community. But throughout, there was only the warmth and ease of a man very at home with himself and his world. I never felt even a hint of the bitterness one might expect from a magic legend who remained more or less unknown to the public at large. There was no suggestion of jadedness, or pretension, or the bewildering egomania that pervades our craft. He had of course his distinctive look, but he was never affected, never contrived (after all, he always had that look: I imagine he emerged with beard and garb fully dressed from the womb, greeting a world that would come to adore him with a rasping basso tremendo). The aura that surrounded Eugene (on stage as well as off) was one of twinkling mischief, of naughtiness, of gravitas without solemnity. Perhaps most powerfully he carried that air about him that the most charismatic actors often bring to their parts: that of I have a secret. It was irresistible. He appeared to me a man profoundly at home with himself; one who had made a comfortable space for whatever demons still undoubtedly announced themselves on occasion. And unheard of for a magician: he didn’t try to impress. But his masterstroke of story-telling was that of his ending. Mystery lies in ambiguity. Eugene said towards his end that he was excited to finally meet the Big M Mystery. How profoundly that statement must have moved his friends; how beautifully a lifelong reverence for mystery served him at the end. It is in our last chapter of life that the importance of authoring ones narrative is paramount. When a book or film ends, it makes sense of what has come before. When a life ends, there is no meaning: often only absurdity. We have to find that meaning for ourselves. It is hard to do this if we see death as a terrifying stranger rather than as a companion, and nothing in our culture encourages us to make our peace with its ever-presence. Since we proudly stripped away superstitions from our thinking a few hundred years ago, we have all but lost touch with any cultural narratives that provide a sense of meaning around death. Hence the proliferation of mediums and psychics, who step in to provide some tawdry semblance of significance. Eugene’s séances by comparison offered only further mystery. So we scrabble blindly when death approaches, and in doing so, we often become cameos in our own stories. The main roles are given over to doctors or loved ones who make decisions for us and above all try to prolong life, which is quite different from preserving its quality. The only narrative the dying person is offered today is that he or she is ‘fighting a brave battle’, and this only helps the healthy onlookers feel a little better. For the terminally ill person it is an imposition, which adds pressure to seem brave for everyone else’s sake. And of course it presupposes eventual failure. I could not read his mind, despite the promises of our professions, but by all reports Eugene died as a man in charge of his own story. I spoke to one of his dearest friends (and doctor) soon after his passing: I am told Eugene had nothing but deep gratitude for a life that surpassed all his expectations. Unattached to possessions, he adored the hospital rooms with which he had become quite familiar, marvelling at the food and how well he was looked after. Mortality had become a comfortable theme for him, and when a cancer diagnosis came he declined to fight it with chemotherapy. Pneumonia arrived instead, and continuing the theme of a life well lived, he took a quiet ownership of death too. A lifetime of loving and of gathering people together meant that he finished his life in the way he wished. He died very well. Finally, it’s rare one gets to choose ones family, but Eugene was able to do this. And this family of close friends will now miss him terribly. Yet nothing that burns so brightly is snuffed out easily. Eugene deeply affected so many people: those dearest loved ones and partners in magic, his friends, his students, those who have learnt from his books and videos, the audiences who have loved his performances, and the magic world which will honour him. Eugene knew that the self is not fixed but malleable, ambiguous and situated: it extends into the world. So we should honour this. He is not absent: we can still find him in all of those people. When we die, we leave behind an afterglow in the hearts and minds of those who loved us. Eugene’s afterglow will be felt for a very long time. Those who were closest to him will recall and settle in their reveries of Eugene; they will now and then feel what it would be like to be him, to laugh at what he would laugh at, to react or raise an eyebrow or ponder a thought in his way. When they do, they will recreate in themselves the particular pattern, the unique twinkling consciousness that defined him. The more sympathetically they knew him, the more him it will be. And maybe this is where we find the Big M: perhaps it is something to do with the love between people that provides the mechanism for the self to survive death in the only meaningful way we know. In those moments, in each of those imperfect, invisible versions of Eugene that will spring into life within those who know what made him him, his distinctive Eugene-ness will appear again. And again, and so on, through all of us, and over a very long, slow fade. There used to be a monthly gathering of magicians at a restaurant in Chicago's loop area, Green something. He would attend those sometimes and i got to meet him. He was always very nice and gentle. He was good friends with David Parr and PT Murphy, who always gave me a ride there. Thanks for sharing Derren's tribute Mike. Wonderful. Eugene Burger is a guiding light in the art and craft of magic... the gifts he shared will live in the hearts and minds of many mindful magicians and mentalists for years to come. In my thoughts he is now an immortal, like all the legends before him continuing to live on in the work of others. The wise amongst us will study his works, listens to his words and contemplate how to integrate his concepts into our magic and mentalism, and further into our daily lives - the less than wise out there will continue to do tricks, and fail to miss the magic. "What was the quality of relationship that I was able to establish with these strangers in 5 minutes?" What a wonderful question for each of us to contemplate after a performance, think how much greater our magic could become by doing such a simple thing. The ultimate tribute to Eugene Burger is to absorb his teachings, and bring them to life in our own magical practices. I spent an evening with him at a restaurant in Rochester performing and discussing magic. It was a pivotal meeting and changed my understanding of magic forever. Isn't it great how many stories similar to that of magicfish are being told. Eugene really had an impact on both magic and magicians. It was wonderful just to be in the same room with him. We had a party at our house in La Porte IN some years back. The guest list was replete with performers of various sorts. We had magicians, musicians, story tellers, yo-yo experts, artists etc. A couple hours into the party, the door bell rang. It was Eugene with Giovanni and a couple of other people. They had driven from Chicago to be with us! I had no idea that Eugene was going to show up. He entertained for an hour with mind bending magic. He did the Trick that cannot be explained over and over in varying ways. It totally killed. Then suddenly he and his friends disappeared. They were off to some other event. People talked and talked about what had happened. Even the lay people commented on how they felt being around Eugene. It wasn't just the magic that affected them. It was Eugene's presence - his "vibe." Everyone knew that something very special had happened. Eugene proved again that magic really exists in the world. You know, as a magic store owner, I usually feel like I know someone personally just because of the sheer amount of items I carry which bear their name. Eugene was one of these people. Every time I packaged up one of his books or DVD's, it was like shaking hands with a friend whom I never met. And while I wish I could have had the honor of meeting Eugene face-to-face, I am relishing in the stories and eulogies from everyone who is sharing their memories about him. So thank you all who have posted here and bring your experiences with Eugene to all of us who may not have had the privilege of sitting down with him. I for one will really miss him, and seeing his face on everyone of his books we ship will bring a somber feeling to my heart herein out. We are all very lucky to have had a master like Eugene to be a huge part of the craft and industry we love so much. Very sad news. A loss to magic. I believe there are a lot of magicians that think of Eugene as a dark figure who performs dark magic. After all, he is the one who wrote "Spirit Theater" that delved into séance and bizarre magick. Eugene was a member of The Inner Circle of Bizarre Magick and attended many of the early Gathering of the Magi. The Gathering was more like a gathering of friends and family rather than a magic convention. It had a friendly feel to it. Everyone was approachable and the magick presented in the workshops, works in progress and shows were high in originality. Never did we have to check with each other to see what effects we were performing because we knew there would be no duplications. Another great part of the convention was the hospitality suite. Stocked with food and drink (alcohol and non) it is where everyone gathered after the day's festivities were done to talk about magic, inner secrets and life in general. Magic was presented but there were no clumps of finger flingers. In fact, rarely did you see a deck of cards unless it maybe was a tarot deck or something similar. Eugene was in the hospitality suite one evening holding court with me, Adrian Deery, Vlad and a few others. The discussion was along the lines of the deeper meanings of magic. Really serious stuff here. If felt like a combination think tank and quasi debate where no one was actually debating just giving their take on the subject. So, we're all in this esoteric, hypnotic lull. Someone asks Eugene a question and he begins to answer when something nefarious catches his interest out of the corner of his eye. His serious demeanor broke and a smile appeared on his face. The twinkle in his eye expanding 3 times and he turned to the lady coming over holding a plate and Eugene clasped his hands together and said in a joyful, child-like manner, "Oooh, cookies!!!" It might have been here where Vlad coined the phrase (or the phrase had been coined before and it took on new meaning): "Come join us on the dark side. We have cookies." Eugene's Sponge Ball Routine was beautifully constructed; fun and highly entertaining, with wonderful lines and gags, interaction with, and involvement of, the people, clean, strong magic, fabulous timing and misdirection, and a blockbuster finish. What more could you want in a presentation? The routine shows the lighthearted, comedic side of Eugene, as opposed to the dark or bizarre magik aspect most magicians associate with him. The quote from Chris Angel really struck a chord: "Eugene understood that magic is about far more than secrets. It is about telling a story. It is about moving people emotionally." Angel paused. "Aside from that," he said, his voice cracking, "he was a magic human being. I hope his voice echoes in my ear until my dying breath." When I think of Eugene, it makes me want to go outside on a clear night and gaze at the stars and infinite galaxies, and to ponder and appreciate that there is infinite and immortal magic alive in this Universe that transcends our usual experiences of life. Every so often on this Planet there appears a visionary - someone who lights the way. Someone who inspires you to the idea that life itself is magic, that there is a very thin veneer between illusion and reality, and that the possibilities that dwell inside of us are limitless. To me, one such spirit is Eugene Burger. The digital version of the September issue of Genii was live today. I clicked over to More Genii Speaks for Richard's monthly message - almost always fun to watch, but not this month. He was visibly upset about Eugene's death. He promised the October issue will feature a cover and articles on Eugene. TEACHING MAGIC: A BOOK FOR STUDENTS AND TEACHERS OF THE ART. great news - thank you for the tip off. I have just come across the following couple of audio files of Eugene and had to share them. Most of you will have heard them already, I assume. However, they are simply amazing and needed to be shared. The quality of the recording and knowing that Mr Burger is now in a better place makes these even more evocotive and haunting to listen to. I doubt anyone else will even come close to the ability of this man to weave a story; he truly was and is a legend. Genii subscribers: The October electronic issue is up and there are several wonderful tributes to Eugene to be found there.